If you’re as an intrepid of a traveler as I am, you probably want to go on an epic vacation to a place that isn’t home to flocks of tourists. I know that feeling. There’s something so alluring, so exciting about the thought of “going somewhere that few others have been before.” To help you plan this exact kind of trip, we’ve pulled together some travel experts’ favorite underrated destinations from around the world. Bologna is one of the most underrated cities in Italy, caught between (and just an hour from) two of the most popular and most visited cities in the world – Venice and Florence. Surprisingly, Bologna has been overlooked for so long but that’s beginning to change. Known as the culinary cradle of Italy, Bologna is fast becoming a hotspot for foodies. Its Italian nickname “La Dotta, La Grassa e La Rossa” – “The Educated, The Fat, and The Red” – sums up the very best of what this central Italian city has to offer: La Dotta honors its University, the oldest in the Western world, La Grassa for its renowned cuisine, and La Rossa for the stunning red clay rooftops that crown the city. This part of Italy is also home to “Motor Valley”, where brands like Ferrari, Maserati, and Lamborghini create the world’s high end performance automobiles. Whether you’re a food lover, car lover, or just in search of a more authentic Italian city, the fact that Bologna is still underrated is precisely the reason you should go! Mozambique is a destination that’s lesser-known than the cliff-filled cities of South Africa, the sparkling beaches of Zanzibar, or the incredible safaris in Madagascar, Kenya, and Tanzania. However, it’s a destination rich in culture, beautiful landscapes, and fascinating Portuguese heritage. Here, much like many of its African counterparts, there are nature reserves like Gorongoza National Park with amazing wildlife, sparkling blue beaches in the Bazaruto Archipelago and Vamizi Island, and more. Mozambique deserves a spot on any Southern African itinerary! Vientiane, the capital and largest city in Laos, is often unfairly overlooked. Some say Luang Prabang is more beautiful. Others would rather head to Vang Vieng for adventure. The truth is, given the chance, Vientiane is a charming and historic capital worthy of a visit. Unlike many capital cities, Vientiane has a laid-back vibe without all the crowds and noise. This doesn’t mean that it’s boring with nothing to do. Wandering around the tree-lined streets will reward you with Buddhist temples, beautiful French colonial architecture and numerous street markets. Visitors can easily get around on foot, bike or tuk tuk. Catch a sunset along the river or come across monks going about their daily routine. Vientiane is not the type of city experienced with a to-do list. This is a city best explored leisurely and with an eye out for its charms. When it comes to underrated destinations, Lebanon definitely tops the list. The Lebanese Republic is located at the crossroads of the Mediterranean Basin and the Arabian hinterland, it is bordered by Syria to the north and east and Israel to the south. Besides the fact that it may not be a typical holiday destination, the country has everything from snow-covered mountains (yes, you can go skiing) to the shimmering Mediterranean Sea (beautiful beaches included), from historical sites such as Baalbek and the Beqaa Valley, to cool bars, clubs and traditional restaurants in Beirut. But the best thing are the Lebanese people themselves. They are bursting with friendliness and kindness and make every trip one to remember. Only a few people who travel to South America decide to visit Ecuador. It’s a small country surrounded by touristy destinations such as Peru and Colombia, which probably doesn’t help Ecuador’s tourism industry. However, Ecuador is a great option for nature and hiking lovers. I can think of many reasons why it has great potential: tropical forests, high-altitude mountains, vibrant cities, a fascinating culture, beautiful colonial towns, and some of the craziest landscapes in South America. You can hike the Quilotoa Loop, the Cotopaxi an other volcanoes to enjoy surreal views. The northern city of Otavalo boasts the most famous indigenous market in the country, and the city of Baños is a great place for adventure sports like bungee jumping, rafting, mountain biking and zip-lining. If you are willing to spend a bit more money, you can fly to the famous Galapagos Islands, where you will see a variety of beautiful endemic flora and fauna and enjoy top-notch diving. As you can see, you have many options while traveling in Ecuador! Almost every traveler strands in Bali or the islands around but Indonesia is more than just that. Some may go to Java, a few go to Sumatra but only a handful people explore Sulawesi and its spectacular Central Highlands. This lush green region has a lot of incredible things to offer for tourists and is where you can get up close and personal with the unique Toraja culture. The lives of Torajan people evolve around funerals, as this is the most important thing in their culture. People get buried above the ground and visiting these creepy but unique burial grounds is one of the best things to do in Tana Toraja. 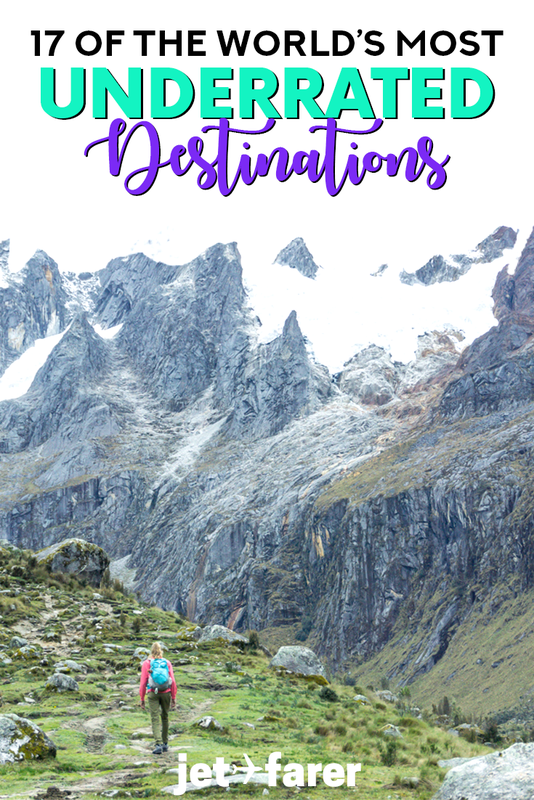 On top of that, the region is perfect for amazing hikes, visiting coffee plantations, mountain biking tours, white water rafting, and more adventurous tours. The best thing about this is place being an underrated tourist destination is that the value for money is incredible. Not too many folks have made it to Guyana. Probably because most people confuse it with Guinea, French Guiana, Papua New Guinea, or Guinea-Bissau. Or have just never heard of it altogether. 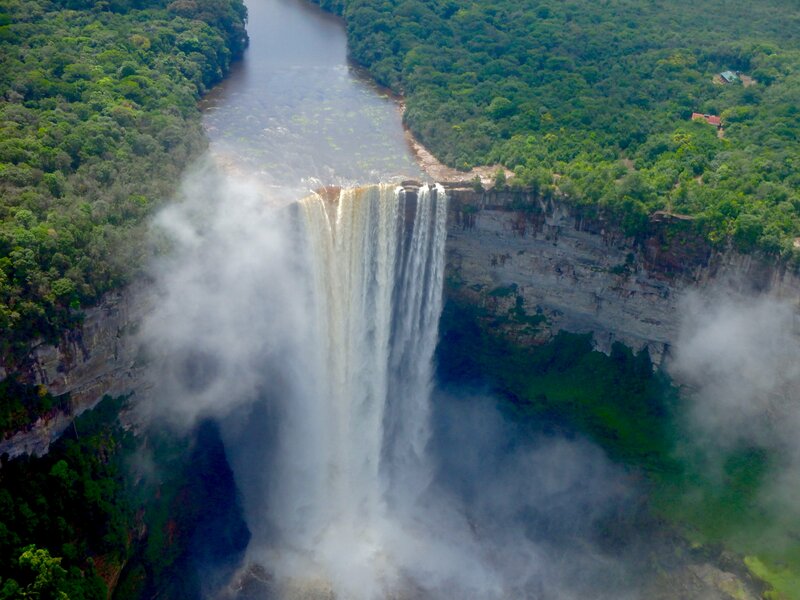 But Guyana, located on the northern coast of South America is not only truly unique, but a fascinating place, with wild flora and fauna, intriguing culture, and one of the most stunning waterfalls in the world. A major draw, Kaieteur Falls is known at the ‘tallest single drop waterfall in the world’ and is located right in the heart of the Guyana’s Amazon jungle region. An hour flight, or 6 day hike, will take you to the great cascade. You will never feel more remote than when you are standing just several meters from such a natural force in the middle of nowhere. Guyanese culture and food is a mosaic of Caribbean, West African, and South Asian, and Guyana’s self-identity is just as unique. Not for the faint of heart, Guyana isn’t on many people’s travel lists, but it really should be! The burgeoning IT metropolis of Bangalore is often overlooked by travellers as it lacks the world-class, wow-factor sights of some other Indian cities. Those that do visit are often only stopping en-route to savour their creature comforts (think Marmite from Spar supermarket and purchasing clean knickers from M&S) before getting back on the road. However, with it’s green open spaces and it’s benevolent climate, due to it’s elevation, Bangalore is a cool respite to the intense heat of elsewhere in India. We currently live in Bangalore and we love it. Of a weekend, we love nothing more than to stroll around Lalbagh Botanical Gardens looking monkeys, followed by afternoon tea at the exquisite Taj West End. Or visit the one of the largest Iskcon temples in the world, followed by cocktails down MGRoad. Immersed in the natural chaos of these typically Indian streets, thriving with vibrant markets and colourful temples, lies pockets of Western influence and the fusion is fascinating. Bangalore is the true front-line of development and a visit will perhaps help the intrepid traveller better understand the complicated fabric of India. Huaraz is often overlooked by visitors coming to Peru as it is not on a usual gringo trail Lima-Arequipa-Cusco-Puno. Yet, the surrounding mountains of Huaraz, Cordillera Blanca, offer the best outdoor activities in Peru. It can very easily be called the South American outdoor capital. Only people with a deep passion for the outdoors spent here at least several weeks. Huaraz and Cordillera Blanca remains one of our most favourite destinations in South America. Huaraz sits at 3,052 meters above sea level which means acclimatizing for a few days is essential. Sandwiched between more famous destinations like Seattle and L.A., the State of Oregon is often overlooked. While Portland has certainly made a name for itself, its appeal is somewhat seasonal, as the frequent rain and grey skies can become quite dreary. But head toward the middle of the state – Central Oregon, to be exact – and you’ll find a region worth visiting year-round. Central Oregon is best enjoyed outdoors, with summer sports including paddling, hiking, cycling, white water rafting, and golfing. In winter, areas of the High Desert turn into a snowy wonderland for skiing, snowboarding, sledding and ice skating. The region is also home to some of the country’s top craft breweries. And it doesn’t hurt that dining and shopping in Oregon is always tax-free! Oregonians on vacation often stay in Bend or nearby resorts like Black Butte and Sunriver. But to truly get off-the-beaten path, check out Redmond Oregon and its surroundings for the same great activities with even fewer crowds. Finally landing into Yangon, Myanmar, after a long, long journey, we weren’t even going to bother looking out the window of our taxi as it sped to our hotel. Most of the people we knew who had been there told us to skip it – there was nothing to see. 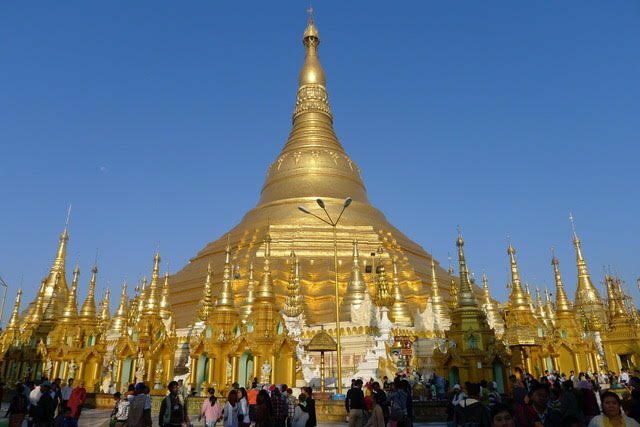 Then something caught my eye…there she was – the Shwedagon Temple. I immediately told our driver to stop. Two very bling Chinthes (the lion/dragon creatures) greeted us, blocking our view of what Kipling called, “a beautiful winking wonder that blazed in the sun.” We would have to wait until the light of day to bask in all her glory. Yangon held so many treasures that we were sad we hadn’t allotted more time to our stop there: the Pegu Club, the Secretariat, Scott’s Market, the architecture, the Synagogue. We could have spent a week there and explored all its sites. Spend the time to get to know this city – it’s well worth it. The tiny country of Luxembourg often gets overlooked in favour of its more prominent neighbours: France, Belgium, and Germany. Why bother with Luxembourg when you could just as well go to Paris or Brussels? What is there to see in Luxembourg anyway? Before I went there a couple of years ago, I couldn’t have answered this question. Now, I know that Luxembourg may not as be big and famous as some other places, or offer such an abundance of attractions, but it has a charm all its own. Luxembourg City is settled into a picturesque valley, full of parks and greens that invite you to lounge around in the sunshine. The town centre is small but charming and atmospheric. As for sights, Luxembourg doesn’t have many, but one impressive attraction can be better than a host of less exciting ones. The Luxembourg Casemates are caves build into the mountain looking over the city. You feel like being deep underground while following staircases that funnel deep into the mountain- until you reach an opening with an impressive view over the city. A place truly worth stopping for! Too often people are mistaken into thinking Dubai and Abu Dhabi are the only places worth visiting in the UAE. Head just a little further north from Dubai and you’ll find the Emirate of Ras al Khaimah – or referred locally to as RAK. RAK is a great combination destination for enjoying the best in luxury and relaxation at one of the numerous beach side resorts on Marjan Island, or alternatively getting in touch with nature in the mountains. The Hajar mountains cut right through RAK, with the tallest peak Jebel Jais being a major attraction for outdoor enthusiasts and wadi seekers. The desert here is also a great attraction, you’ll find the Al Wadi Desert resort which offers a huge range of nature and eco activities with the Al Wadi nature reserve on their doorstep and the likes of falconry displays through to guided night tours. Alternatively, adventurers can pick their bit of sand here for sandboarding, dune bashing, horse and bike riding or just camping under the stars. New to RAK is also the world’s longest zip line opening in December 2017! For a real treat, head slightly further north and cross the border to the Omani enclave of Musandam. The cliffside drive to Khasab is up there as the most dramatic in the world. You can do this as a day trip or stay over camping on the beach if you’d prefer! When most people think of Alicante, they think of cheap beach bars and drunken Northern European tourists. But step away from the coast for a minute, and there’s a relatively undiscovered – and extremely underrated – part of Spain on your doorstep. Rural Alicante is beautiful, and home to some wonderful natural attractions including castles, vineyards, unspoilt towns, and fantastic walking routes. Accommodation is considerably more affordable as well, not to mention much less crowded. And, because coastal Alicante is already such a popular destination, it’s easy to fly there too: flights to Alicante depart from many German, French, and British airports, with many of these routes flown several times per week. The province of Sorsogon is a gorgeous place in the Philippines, and one of the most underrated. Most people would prefer to spend time in the more popular attractions in the country such as Boracay, Cebu or Palawan, and this gem goes mostly unnoticed. Sorsogon has very welcoming & friendly locals, which is always a plus point in traveling. Also, it also has a diverse range of nature attractions. There are the quiet beaches in Subic Liit and Subic Laki and the pink beach in Tikling Island, the ecologically friendly Juag’s marine sanctuary, the green majestic lake of Mount Bulusan. There are also hot springs in the area and beaches with strong waves for surfing. In certain months, you can spot whale sharks in the oceans in Donsol. Even the local communities in Sorsogon are a wonderful sight, with farmer houses beside rice paddies and coconut trees. For now, Sorsogon is off the tourist radar and now is the perfect time to visit this province in the Philippines. When people travel to the United States, they tend to hit big cities on either coast, either New York or Los Angeles. But those cities aren’t representative of their entire state, let alone the whole country! The Midwest, including my former home state of Wisconsin, is where you’ll find the friendliest, most down-to-earth people. Many citizens are drawn to larger cities, like Chicago, so you’ll even find amicable people there. Perhaps “foodies” think there is nothing up-to-scratch in smaller cities. Sure, the Chinese takeout food isn’t authentic or as nice as options in huge cities like London, but you have to look no farther than Adam Richman’s TV shows, like “Man Finds Food” (or the incredibly gluttonous “Man vs. Food”) to realize that delicious local cuisine can be found in small towns. Not everybody orders steak “well done” any more. The Midwest is home to some great scenery, too. Although relatively flat, there are bluffs that are brilliant when covered in bright autumn foliage, serene lakes and even the occasional waterfall. When you explore the Midwest, you enjoy the cosiest area of the United States. Lake Atitlan in Guatemala isn’t widely known except by people who have already traveled Central America – and what a shame that is, because it is seriously one of the most beautiful lakes I’ve ever seen. Ringing the lake are several volcanoes, including the towering San Pedro volcano, making for amazing views and beautiful sunsets. There are several towns and communities along the lake, each with different vibes. San Marcos is the hippie hub; San Pedro is the party spot; San Juan offers a more typical local experience. You can kayak or paddle board on the lake, eat typical Guatemalan food, shop Mayan textiles, hike in the surrounding mountains, or just relax in the sun!